Lately I have been thinking a lot about Superheroes. I have also spent a few too many hours down the rabbit hole of internet googling. I can now share that Batman’s biggest strength and also weakness is that he is human, ironman can heal his own armour and that elsatigirl stretches herself so much she is vulnerable to getting stuck in doors! My recent (and admittedly first) interest in superheroes makes a little more sense if I explain the title of my recent art therapy workshop; “Superhero’s Get Sad too”. Since updating my knowledge of superheroes and sneaking in a few non-traditional (but popular) characters into the planned activities, I have been interested in why kids are so naturally apt at idolising fictional characters. Without getting too technical; children’s social and emotional development is shaped somewhat by how they make sense of the world around them. Children use a mixture of imagination and observation to construct and explore their reality and to distinguish self and other. During childhood children develop and thoroughly utilise the ability to symbolise, an ability in adulthood we take for granted. Symbolism is the representation of ideas or qualities through a thing (I said I wasn’t getting too technical!). It is a cultural and social norm that is a little tricky to describe (You can read examples and an explanation here). It is precisely the symbolism of superheroes; what they represent, that makes them so attractive to younger eyes. Superheroes are the perfect example of embodied symbolism. Their powers, weaknesses and characteristics are often symbolic of bigger meanings and in true fashion of any literary or film pursuit they encode larger themes, morals and existential questions. Basically Superheroes and other popular characters are attractive to children because they simultaneously evoke curiosity, imagination and symbolic meaning. Ask a child why they love a character or superhero and consider their answer in the wider context of their world. Children idolise characters because they portray something that may be enviable but not possible or practical for the human race, such as flying or breaking rules. Or the character may have high doses of a highly praised attribute such as strength, perseverance or the ability to conquer evil. It’s great that superheroes can offer insight into the dreams and desires of children, and assist them in perceiving the larger environment and wider conundrums of the world but what about the dark side of superheroes? What happens when children are idolising less than morally appropriate characters? I am admittedly a little behind with the whole anti-hero thing that seems to be a current trend. With characters like Deadpool becoming popular, my optimism for the superhero lesson may fade fast. But for now I am proceeding with relative optimism and a healthy dose of caution. Looking a little more at the dark side of superheroes’ and the pitfalls of children idolising them and we come to the key controversy of the use of violence to solve issues. Hannah Schacter’s blog discusses this whilst reflecting on a study into children’s behavioural changes after exposure to superhero violence. Unsurprisingly it is found in the small studies presented that consistent exposure to violence can increase a child’s violent behaviours. Before you panic and ban Batman from the house, Schacter raises a very important point that children need help to understand and distinguish appropriate behaviour and the difference between fiction and reality. This requires parents and caregivers to be active in discussing and exploring themes of violence, good and evil and also knowing where to draw the line. Cruella Da Ville, Rasputin and the White Witch used be villain enough to scare most young children and whilst times may have changed children’s tolerance for fear has not. If you happen to be a parent of a villian loving child, try reading Why Do Kids Like the Bad Guys? by Mark Oliver. He will share your trepidation that your child vouches for Jafar over Aladdin and Hook over Peter Pan. Oliver points out again that children need help to understand right and wrong and that they can be attracted to characters that make them feel empowered. Aside from wariness about violence what are some of the other lesson superheroes can teach our children? Moresi points out in her blog “Superheroes; how do they influence our children” that superheroes teach children to dare, that their strengths and weaknesses are unique and to develop and stand by their morals. Sandler from huffington post also points out that superheroes can also teach children about weaknesses, having “enemies”, having a cause, believing in dreams and the necessity of working hard. Which brings me to a similarity between what superheroes can teach children and art therapy. One of the reasons that art therapy can be a useful medium to engage children is because it creates a triangle of communication. Instead of having a dialogue between two; the child and the therapist, it ushers a third party into the room; the artwork. The artwork or art process can relieve pressure by acting as a diversion for feelings, concerns and thoughts. It’s like that time you told a chemist or doctor about a friend’s embarrassing health problem when you were talking about yourself (we have all done it!). Superhero’s or characters can essentially become a version of the same principle. It is much less confronting to talk about superheroes or popular characters at least to begin with. Superheroes come in handy in art therapy, they assist in talking and exploring strengths, difficulties and emotions. Superheroes can become a theme for numerous games as well as art-based activities. After exploring a child’s attitudes and perceptions of superheroes, a therapist can begin to explore a child’s perception of themselves and their experience. 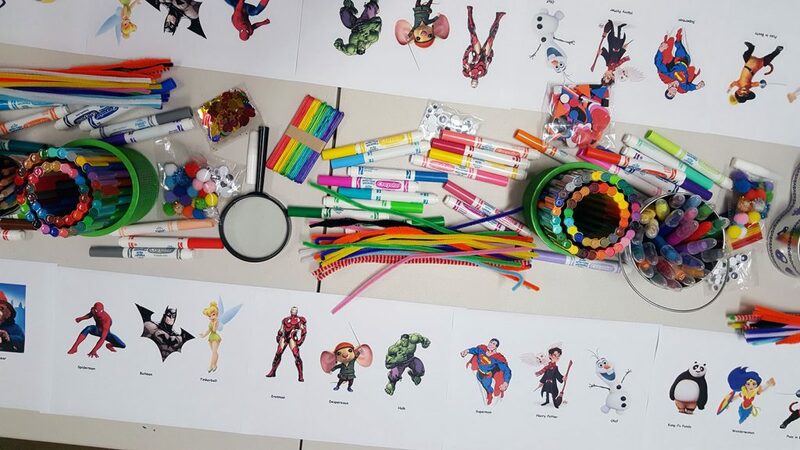 Designing themselves as a superhero can be a great activity for self-reflection, strength building and acknowledging dreams, goals and vulnerabilities. If your not an art therapist the nature of this activity can be simplified and used verbally. As a caregiver or other professional you may be able to explore the weight and balance of weaknesses and strengths though superhero similarity. For example is your child clumsy and bothered by it? Think kung-fu panda. Always getting wayward and into trouble? Try Puss in Boots. Insanely jealous of siblings or friends, think Tinkerbelle. Worries about the world? Batman is your pick. And just before I finish of my superhero ramblings, there is one other use for an all-time favourite superhero. Yep Spiderman can help kids learn mindfullness! Find the full activity on Kids Relaxation. So in summary your child’s endless obsession with Spiderman, Wolverine or even Minions may come in handy. You make be sick of the tug-a-war to wash the never taken off spiderman shirt, or the endless relaying of Despicable Me but these characters offer the gateway to otherwise difficult conversations.